Original Etchings, Lithographs & Monoprints. Original Etching. Minimalist Print. Contemporary Art . 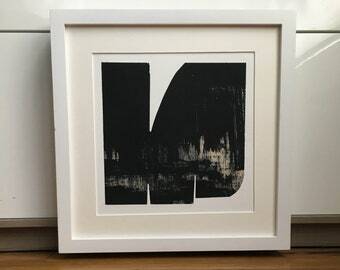 Monoprint: Choke 1 (in Black + Tan ) . Print Size 21" x 21" . Unframed . MInimalist Print. Contemporary Art . 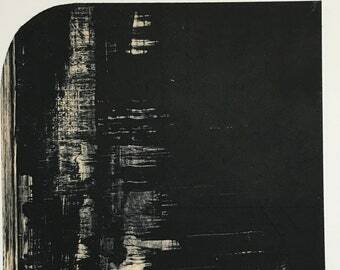 Monoprint: Grain 1 (in Black + Tan ) . Print Size 21" x 21" . Unframed . Triptych. 3 Art print Set. 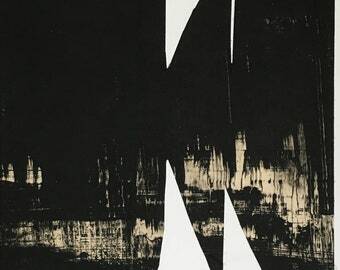 Monotype. . Minimalist. Black + Off White Home Decor. "Muro" 12, 9 +11 Print Size 11" x 11"each unframed . Abstract Diptych . 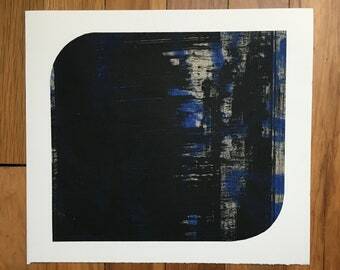 Art Print Monoprint. Affordable Art. Black white + tan Decor. "Loose Ends 1" Print Size 13.5" x 12.5" . unframed . Always happy to work with designers + retailers . . . contact me to collaborate. ▷ Large reproductions of my prints, Fluid Strokes, Evolve Arch, Fossil Ripple Effect + Intertwined were sold at Pottery Barn Stores, USA. 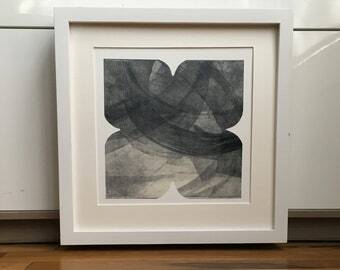 ▷ My print “Drawn Straws” was featured in Crate & Barrel’s Fall Collection 2012 & in Season 3 of ABC's show "Revenge" 2014. ▷ Thanks for visiting my shop. Like me on facebook for updates & promotions. Etching Print. Monotype . Art Print . blue-ish black, white + tan. Abstract Art. "Element 11". Print Size 11" x 10" . unframed . Etching Print. Monotype . Art Print . blue-ish black, white + tan. Abstract Art. "Element 10". Print Size 10" x 10" . unframed . Etching Print. Monotype . Art Print . blue-ish black, white + tan. Abstract Art. "Element 9". Print Size 10" x 10" . unframed . Etching Print. Monotype . Art Print . blue-ish black, white + tan. Abstract Art. "Element 8". Print Size 10" x 10" . unframed . Affordable Art. Monotype . Art Print . blue-ish black, white + tan. Abstract Art. "Element 7". Print Size 10" x 10" . unframed . Affordable Art. Monotype . Art Print . blue-ish black, white + tan. Abstract Art. "Element 6". Print Size 10" x 10" . unframed . Affordable Art. Monotype . Art Print . blue-ish black, white + tan. Abstract Art. "Element 5". Print Size 10" x 10" . unframed . Affordable Art. Monotype . Art Print . blue-ish black, white + tan. Abstract Art. "Element 3". Print Size 10" x 10" . unframed . Affordable Art. Monotype . Art Print . blue-ish black, white + tan. Abstract Art. "Element 2". Print Size 10" x 10" . unframed . Affordable Art. Monotype . Art Print . blue-ish black, white + tan. Abstract Art. "Element 1". Print Size 10" x 10" . unframed . Etching Print. Affordable Art. Monotype. blue-ish black, white + tan. Abstract Art. "Beam 1". Print Size 12" x 10" . unframed . Etching Print. Affordable Art. Monotype. blue-ish black, white + tan. Abstract Art. "Beam 2". Print Size 12" x 10" . unframed . Etching Print. Affordable Art. Monotype. blue-ish black, white + tan. Abstract Art. "Placid 2". Print Size 12" x 10" . unframed . Etching Print. Affordable Art. Monotype. blue-ish black, white + tan. Abstract Art. "Placid 3". Print Size 12" x 10" . unframed . Etching Print. Affordable Art. Monotype. blue-ish black, white + tan. Abstract Art. "Rift 2". Print Size 9.5" x 9.5" . unframed . Etching Print. Affordable Art. Monotype. blue-ish black, white + tan. Abstract Art. "Rift 1". Print Size 12" x 10" . unframed . Etching Print. Affordable Art. Monotype. blue-ish black, white + tan. Abstract Art. "Brushed 1". Print Size 12" x 10" . unframed . Etching Print. Affordable Art. Monotype. blue-ish black, white + tan. Abstract Art. "Brushed 3". Print Size 12" x 10" . unframed . Etching Print. Affordable Art. 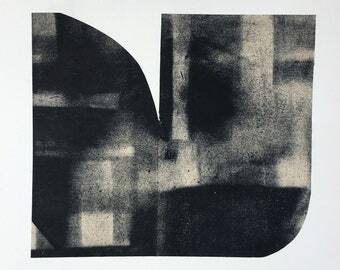 Monotype. blue-ish black, white + tan. Abstract Art. "Placid 1". Print Size 12" x 10" . unframed . Art Print . Minimalist.Black+ off white print. "Slab 1" Linocut 13" x 8" . unframed . Beautiful design feature of my prints Pond, Track& Cassette. My Pond print in a beautiful feature! One of my Either/Or prints shown here in a great holiday design . on exploring my own work. I was lucky to find an American French Tool Etching Press at auction and it gave me the opportunity to set up my own printmaking studio in Austin, Texas. 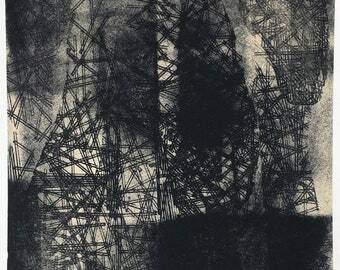 of printmaking and the effort it takes to develop an image through process and time. My recent work explores the contradictions of abstract textures, minimalist layers and formalist design. I joined Etsy in 2011 + The Etsy community has been amazing for support and inspiration. It has opened me up to new opportunities, allowed me to share my art all over the world and given a place to be surrounded by amazing talent. I heart Etsy! My approach is pragmatic and often monotonous relating back to need to find balance and control. I use grids, sewing templates, office labels and other everyday organizational materials. The grids create a controlled system to draw my squares and shapes by hand. There is an evidence of time in my mark making. I explore the repetitiveness of multiplicity of the image, the organization patterns and surfaces through overlaying ink and the contradictions of formalism with sectioning and shape. Through printmaking I can exploit the redundancy of the matrix and use my plates as a visual language, layering and reusing plates to create various monoprints. My prints are a convergence of order and reordering and the revealing and veiling of organized systems and personal habits. I explore the banal of formalism, find order in the layering textures and traces of patterns with a quiet minimalist approach. Hi, I make affordable works on paper. My work is made by hand and executed in my personal printmaking studio on Austin, Texas. I want to share my work with you and am always willing to work you on pricing. Contact me if you need multiples for a business, retail or hotel environment. Unfortunately I do not have time to do custom orders. I want you to be happy with your art purchase. These prints are handmade and colors make look different from computer screens. If your package is damaged or if your prints isn't want you expected, contact me with a week of receiving so we can find a solution. Some prints are one of kind and cannot be be replaced but contact me with questions. I accept PayPal payment in US Dollars & major credit cards. I use FEDEX or USPS, depending on the size and weight of the artwork. If you have special needs in regards to sending/address etc. please let me know. Packages do not require a signature + if you require a signature to ensure safe arrive of your package please message me or leave a note at point of purchase. Shipping within the US normally takes 3-4 working days. Shipping in the US is sent priority USPS & a tracking will be emailed to you after shipping is processed. Shipping everywhere else usually takes about 2-3 weeks. Buyers are responsible for any duties or customs fees. All orders will be shipped within 3 business days of receiving your payment. Packages do not require a signature. Seller is responsible for art through delivery. Work not arriving safely can be exchanged if seller notifies seller within 7 days of arrival. Once delivered the buyer assumes responsibility for the merchandise, whether misplaced or mishandled. ►Shipping costs includes packing box or envelope, foam core, packaging supplies & postage. I will refund overages in shipping estimates over $5.00 back to you.